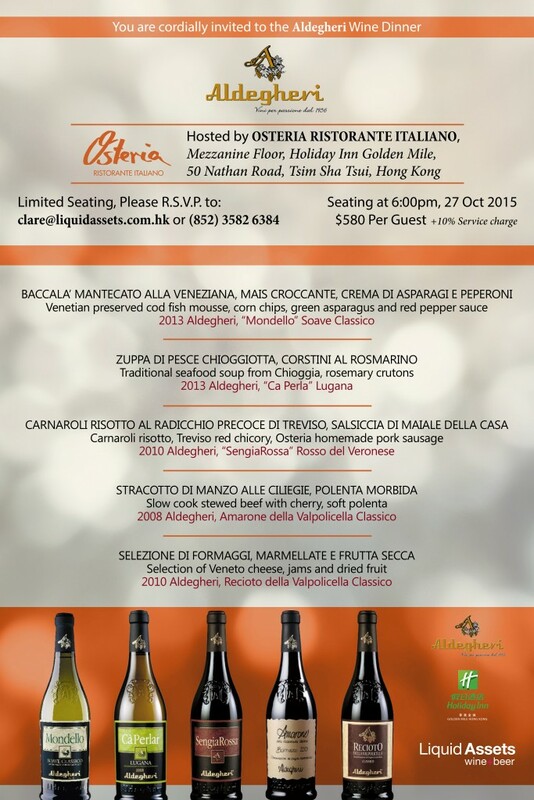 Aldegheri Wine Dinner @ Osteria « Liquid Assets Limited: Wine & Beer! Liquid Assets Ltd is proud to co-host a fantastic wine pairing dinner featuring the renowned Veneto wines of producer: Aldegheri, at the Osteria Ristorante, Holiday Inn Golden Mile. Join us for an evening showcasing five spectacular wines crafted with intricate detail and passion. The Aldegheri family obtains their quality grapes, notable for their rich character, from their vineyards in the hills of the classic Valpolicella area. Chef Paolo Federici and his team have prepared a mouth-watering 5-course menu to match these fine wines – certain to have you coming back for more! RSVP while seats are still available – directly through info@liquidassets.com.hk or give us a ring at +852 2893 1074.